Jack, Lord Pemerton, is a cynical rake forced by family circumstances to seek a bride. Lady Mary Haviland is a plain, charming, but firmly on-the-shelf spinster who offers to help Jack by presenting him with suitable candidates. When Jack discovers information that makes Mary the perfect candidate, their comfortable friendship takes an unexpected turn. Both Jack and Mary were introduced (to readers, not to each other) in the previous book, A Proper Companion. Since that book had two perfectly gorgeous protagonists (a typical first book situation), I wanted these two to be less than perfect. So Mary is short, a bit on the plump side, and somewhat plain. Jack, who’s lived a hard life of debauchery, has a face that shows the results of all that high living – a bit craggy, a hint of dissipation. The opening scene of this book, along with the backstories of Jack and Mary, popped into my head full blown shortly after I began writing A Proper Companion, so, I knew quite a bit about their characters as I wrote the first book. I couldn’t wait to get to their story. No matter how many characters I have created since, none have stayed with me as long as Jack and Mary. I have spun complete histories for them – 5, 10, 20 years after the book ends. Romantic Times Bookclub awards 4 1/2 stars to A Change of Heart. Their review says: "An impressive stylist, Ms. Hern mesmerizes us with the blistering emotional intensity of an unforgettable love story. A powerful and compelling romance. A keeper, by the most discriminating of definitions." Rakehell says: "A Change of Heart is a heart-wrenching, emotionally uplifting story about the redemptive powers of love." Romance News From the Heartland says: "I absolutely loved this book from beginning to end. Have tissues ready for the ending and enjoy this absolutely beautifully written Regency romance." Under the Covers Book Reviews says: "I loved this book. The actions of both Jack and Mary were emotional and both had to overcome their reactions in order to admit their true feelings. I highly recommend this book (and some tissues.)" 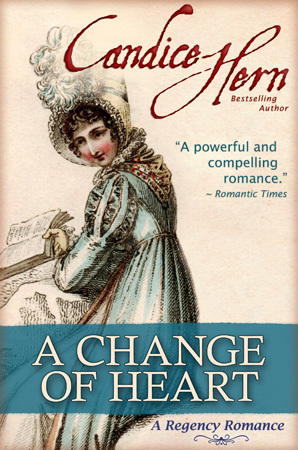 A Change of Heart was nominated by Romantic Times Bookclub for Best Regency Romance. A Change of Heart was a finalist for the CRW Award of Excellence. Jack Raeburn, Marquess of Pemerton, raised his quizzing glass and studied the young girl dancing with Lord Grayston. He leaned negligently against a pillar, half hidden by an extravagant floral arrangement, as he eyed the girl up and down. Miss Pettibone was very fair with masses of blond ringlets and huge blue eyes that gazed up in awe at her noble partner. She was a pretty little thing, Jack decided, as she shyly smiled up at Grayston. He was enjoying a clear view of her full, white bosom rising up and down with the exertion of the country dance when he suddenly felt a presence at his side. Dropping the quizzing glass, he looked over and then down at the tiny woman who stood next to him. How long had she been there, he wondered? She was also looking intently at Miss Pettibone. But then she turned to look up at Jack, wrinkled her nose behind the screen of her open fan, and shook her head. Jack glared down at her and quirked a brow. “Too young,” she whispered, still shaking her head. Jack choked on a hastily suppressed snort of laughter as he watched her eyes move back toward the dance floor. Who was this woman? She looked vaguely familiar, but he couldn’t place her. She was not young, but not precisely old either. Though small, she was nicely rounded in all the right places, he was quick to note. She had ordinary brown hair, a too wide mouth, and a slightly crooked nose; but the eyes that had looked up at him had been enormous pools of hazel. Other than the eyes, her face was quite unremarkable. That was no doubt why he could not place her. She was not the sort of woman who normally piqued Jack’s interest. He dragged his eyes from his unknown companion and once again raised his quizzing glass as he surveyed the ballroom. This time his gaze fell upon a lovely young redhead standing along the opposite wall, flirting with a circle of admirers. She brought her fan to her lips as she giggled at some remark, then snapped it shut and slapped it down on the wrist of her nearest gallant, batting her eyelashes coquettishly. Her hair was absolutely glorious, with one long fiery curl hanging over a creamy white shoulder. By God, no one was going to tell him anything was wrong with this young beauty. Nevertheless, tearing himself away from one last admiring gaze, he reluctantly turned his glass upon the woman at his side and raised his brows in question. She hunched a shoulder and raised her fan to partially cover her face. Jack’s greater height gave him a clear view behind the fan, and he watched as her mouth twisted in distaste. She leaned toward him in a conspiratorial manner without taking her eyes off the girl. Jack grinned down at this impertinent unknown who nevertheless intrigued him. What was her game? Well, whatever it was, he was just bored enough to play along and find out. This time he raised his glass to study Lady Amanda Palmer. Egerton’s eldest daughter, as she was partnered by Lord Ainsley. She was a glowing beauty with glossy dark brown curls and amber-colored eyes. Her face was lit with a spectacular smile and her cheeks were slightly flushed from the dance. Jack’s glass followed the line of her graceful neck down over the softly rounded shoulders to the full swell of bosom revealed by her rather daring neckline. He knew this to be at least her third Season, and her manners were open though modest. Surely there could be no objection to this young lady, he thought as he looked down at his tiny confederate. She sighed and looked up with a resigned shake of her head. “Of course, it is entirely up to you, my lord,” she said in a husky whisper, “but Lady Amanda has an unfortunate tendency toward plumpness. Only look at her mother.” She cocked her head in the direction of the corner of the room reserved for dowagers and chaperones. Jack’s glass followed her gaze toward the sea of plumed turbans in the corner. It was hard to miss Lady Egerton whose bulk took up almost an entire settee. One of the spindly legged chairs used by the other matrons would have surely collapsed under the woman’s tremendous girth. Jack bit back a smile. He dropped his quizzing glass which, attached to its black ribbon, fell against his white brocade waistcoat. He heaved a dramatic sigh. “Well, madam,” he said in a bored tone, “I seem to be foiled at every turn. Perhaps you have a candidate of your own to recommend?” Most likely the woman had a daughter or niece or some other charge under her wing, with hopes of securing an advantageous match. Well, thought Jack, so long as the chit came with a plump dowry, he was willing to entertain any and all suggestions. Jack pulled away from the pillar, straightened up, and peered down at the woman, furrowing his brow in puzzlement. Still, he could not place her, though she obviously knew him. Of course, there was nothing particularly distinctive about her that would have kept her in his memory; although he might have remembered that intriguingly husky voice, surprising in such a small woman. “Oh, but we have met, my lord,” she interrupted. “Oh, good Lord,” Jack mumbled as he raked a hand through his hair and dropped his gaze to the ground. What transgression had he committed in this lady’s presence? Before he could ponder the countless possibilities, his attention was firmly snatched back to the present by the sound of a rich, throaty chuckle. He looked over to find the lady’s head thrown back as she abandoned herself to laughter. The sound was so delightful, almost like a rusty gate, that he could not help but smile. “Lady Mary Haviland,” she said.